Starting school or preschool can be a bit scary. Even the most confident child can baulk at a playground full of unfamiliar faces. Like most parents, I have anxiously (but sounding nonchalant) asked my kids “Who did you play with at lunchtime?”. To be answered with “No one” fills any parent with dread (although, according to my survey of mums at the school gate, apparently all our children are playing with ‘no one’ every lunchtime!). 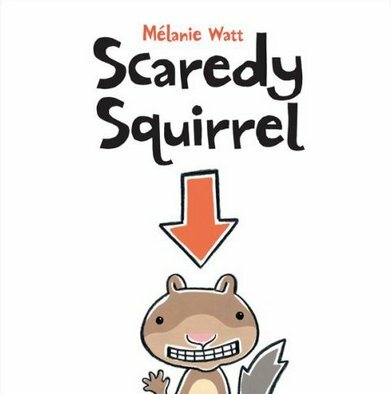 Let author Mélanie Watt and the sweetly anxious Scaredy Squirrel help you through new experiences. Watt has created a number of delightful characters including Augustine the penguin, Chester the cat, Leon the chameleon and Al, a fox that won’t take ‘no’ for an answer. However, it is timid Scaredy Squirrel that wins my heart. Scaredy Squirrel is committed to routine until one day he is forced to take a risk and the results are extraordinary (he discovers he is a flying squirrel). Scaredy narrows down his list and settles on a goldfish as his potential new friend. Goldfish have qualities that appeal to Scaredy including ‘bubbly personalities’, being ‘squeaky clean’ and importantly having ‘no teeth’. But something happens that forces Scaredy to re-evaluate his list, and the animal that wants to be friends with him has a ‘wet doggy smell’, ‘germs’ and teeth! Scaredy learns that you can’t always judge a potential friend by their appearance. I love Scaredy’s endearing, nervous grin and my kids love his funny lists and neurotic plans. For example, “A few items Scaredy Squirrel needs to make the Perfect Friend: lemon, name tag, mittens, comb, mirror, air freshener, toothbrush, chewtoy.” These stories are funny, but don’t make fun. The stories are simply drawn and simply told, yet the message is sophisticated and perfectly pitched for risk-averse three- to seven-year-olds. 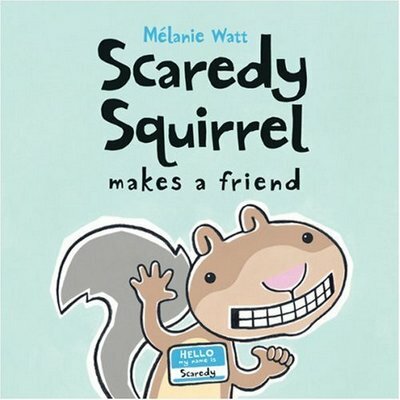 It’s rare to find a funny book about fear, but Scaredy Squirrel is it. Mélanie Watt’s books are available through Fishpond and range in price from $14.95 to $23.97.